"Growing up in Chicago, the measure of a man was his secret recipe for preparing and grilling skirt steak. Here is my family recipe. I have brought these steaks to many throw-downs in my new home in North Carolina and it can compete with all the local favorites. Enjoy!" Make diagonal cuts through the skirt steak on both sides. Cut diagonally about every 1/4 to 1/2 inch, then cut diagonally in the opposite, perpendicular direction. Repeat on the other side of the steak to complete the crisscross cuts that will tenderize the meat. When the meat is prepared, some sections will be very long. I cut the longer sections to keep them under 18 inches long. Whisk together the olive oil, red wine, parsley, basil, balsamic vinegar, soy sauce, garlic, and bay leaves in a large glass or ceramic bowl. Add the skirt steaks and toss to evenly coat. Cover the bowl with plastic wrap, and marinate in the refrigerator for 8 hours to overnight. Preheat an outdoor grill for medium heat, and lightly oil the grate. Remove the skirt steaks from the marinade, and shake off excess. Discard the remaining marinade. Cook the skirt steak on the preheated grill to your desired degree of doneness, about 10 minutes per side for medium-well. Once nearly finished, brush the steaks with the barbeque sauce and cook for 2 minutes. 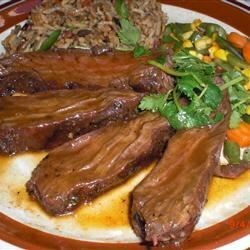 Flip the steaks over, brush with barbeque sauce, and cook 2 minutes longer. Try to find untrimmed skirt steaks in a sealed bag with the juices intact and trim them yourself as this maintains maximum freshness. Buy about 6 pounds of untrimmed steak to yield 4 pounds of trimmed steak. The skirt steak has different types of fat and gristle on each surface. The rounder (top) of the steak has a more marbled type of fat that takes more time to trim. The (bottom) flatter side has a thin membrane. Using a small very sharp knife (I use a curved boning knife), take the knife along the top surface, trimming the top, thin layer of the steak to remove the heavier fat from the steak. There will still be marled fat remaining in the meat and this is ok. Turn the steak over and pinch the thin membrane upwards and run the knife under and remove the thin membranous layer. Didn't do it for our family, meat was very tough! We had friends over for a BBQ and this recipe was a HUGE hit! So Yummy! Will definatley be a KEEPER!!!! This steak is GREAT! I stumbled upon this recipe and gave it a shot. I'm so glad I did, because this is probably my favorite steak to grill. No changes needed, great flavor. This recipe worked out great! I dont really follow recipe measurement since I work in a kitchen but the flavors were delicious. and i am definitely going to make it again.